Now, this Conchorde prototype is a turn up for the books! It has a bit a twisted story to it too. 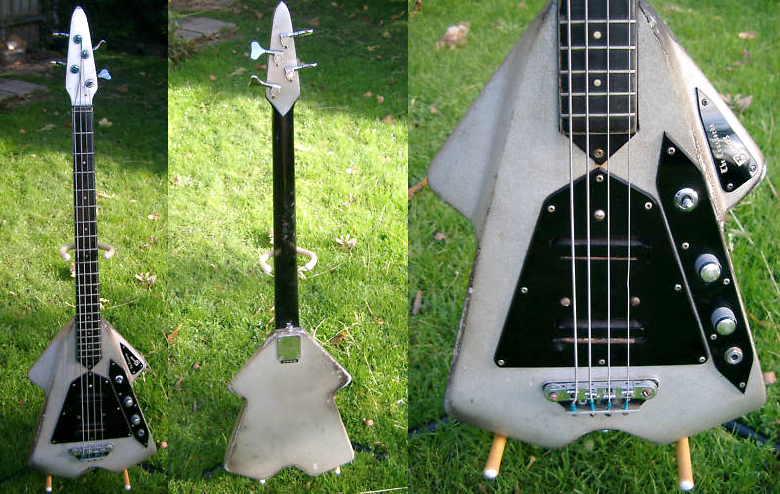 According to the "owner", the guitar was stolen from Jim Burns's workshop! He knows it was stolen because Jim Burns told him! So if you're in the market for a hot guitar, you know where to look. I don't know what eBay's policy on selling stolen goods is but I suspect this auction may not run its course. I believe they check for counterfeits (or as we known them - "Lawsuit", copy etc.) so I suppose they'd check for items that had fallen of the back of the proverbial lorry too. It would appear to be a handmade (by Jim Burns) prototype of the famous and lovely Flyte and probably ought to be in a museum. has pre - Burns U.K. lettering etc. from a dealer in Northern England. I said I had bought it in good faith but he was so angry I had to leave quickly. It sounded good and was good to play. I want to sell this Burns to someone who will appreciate it. U.K. delivery F.O.C. (no charge) international at cost.